The Airbus A400M is a four-engine turboprop military transport and tanker, designed and built by the European corporation Airbus Military. It has been ordered by 10 countries and will replace a variety of aircraft, including the Lockheed Martin C-130 Hercules and the Transall C-160. The project began as the Future International Military Airlifter (FIMA) group, set up in 1982 by Aerospatiale, British Aerospace, Lockheed, and MBB to develop a replacement for the C-130 Hercules and Transall C-160. Varying requirements and the complications of international politics caused slow progress. In 1989 Lockheed left the grouping and went on to develop an upgraded Hercules, the C-130J Super Hercules. With the addition of Alenia and CASA the FIMA group became Euroflag. The partner nations, France, Germany, Italy, Spain, the United Kingdom, Turkey, Belgium, and Luxembourg, signed an agreement in May 2003 to buy 212 aircraft. 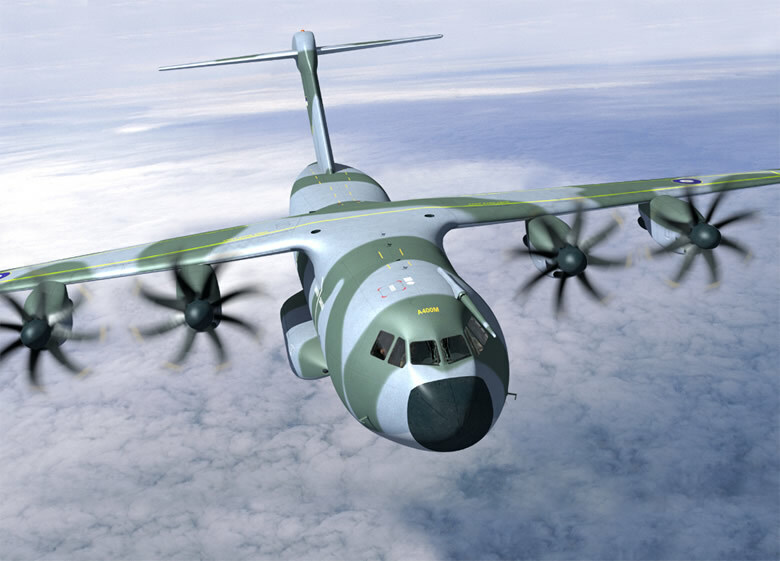 These nations decided to charge OCCAR with the management of the acquisition of the A400M. Following the withdrawal of Italy and revision of procurement totals the revised requirement was for 180 aircraft, with first flight in 2008 and first delivery in 2009. On 28 April 2005, South Africa joined the partnership programme with the state owned Denel Aerospace Systems receiving a contract for fuselage components. 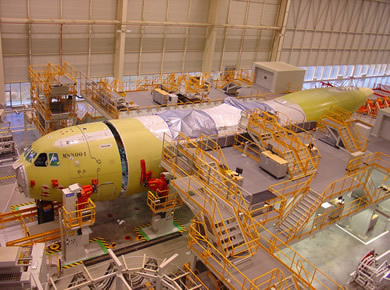 The A400M assembly at the Seville plant of EADS Spain started in Q1 2007. Airbus plans to manufacture thirty aircraft per year. The major assemblies arrive by Airbus Beluga transporters. 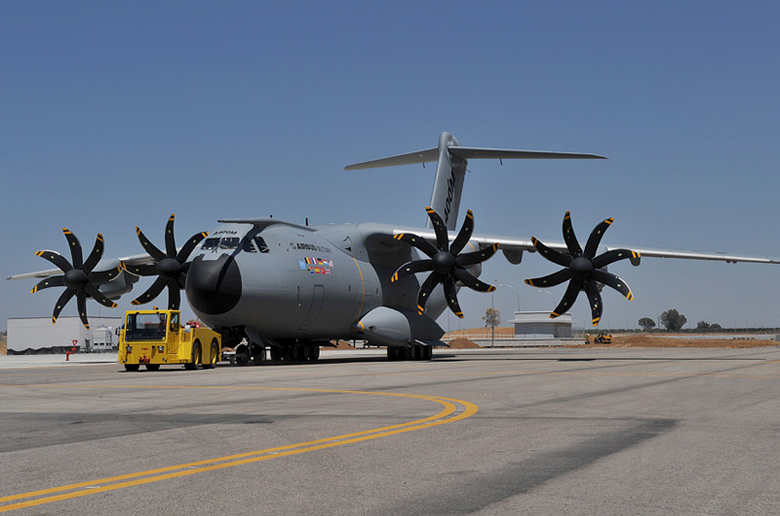 The four EuroProp TP400-D6 flight test engines have been delivered in late February 2008 for the first Airbus A400M. According to EADS the first "static tests" of a dedicated A400M complete structure were started on 14 March in Spain. The first test flight, scheduled until recently for Q1 2008, has been postponed due to program delays, schedule adjustments and financial pressures. EADS announced in early January 2008 that continued development problems with the engines has resulted in a delay to Q2 2008 before the first engine test flights on a C130 testbed aircraft. The first flight of the aircraft, previously scheduled for July 2008 been postponed. Civil certification under EASA CS-25 will be followed later by certification for military purposes. The A400M was "rolled out" in Seville on 26 June 2008 at an event presided by King Juan Carlos I of Spain, while the maiden flight, originally planned for Summer 2008, is now facing on-going technical delays and will likely not happen until later in the year, possibly even 2009. The current focus is on obtaining the required hours of airborne test time on the C130 testbed aircraft. On 9 December 2004, the South African Air Force announced it will purchase eight A400Ms at a total cost of €837 million with options on six more, with South Africa therefore joining the Airbus Military team as an industrial partner. Deliveries are expected from 2010 to 2014. On 18 July 2005, the Chilean Air Force signed a MOU for three aircraft to be delivered between 2018 and 2022. On 8 December 2005, the Royal Malaysian Air Force ordered four A400M to replace its ageing fleet of C-130s. Airbus Military made a bid in 2006 to supply Canada the A400M to meet a tender request for 17 new tactical airlifters to replace their old CC-130E models. The Canadians ordered four Boeing C-17s and 17 C-130J Super Hercules instead. The Airbus A400M will increase the airlift capacity and range compared to the aircraft it was originally set to replace, the older versions of the Hercules and Transall. Cargo capacity is expected to double over existing aircraft, both in payload and volume, and range is increased substantially as well. 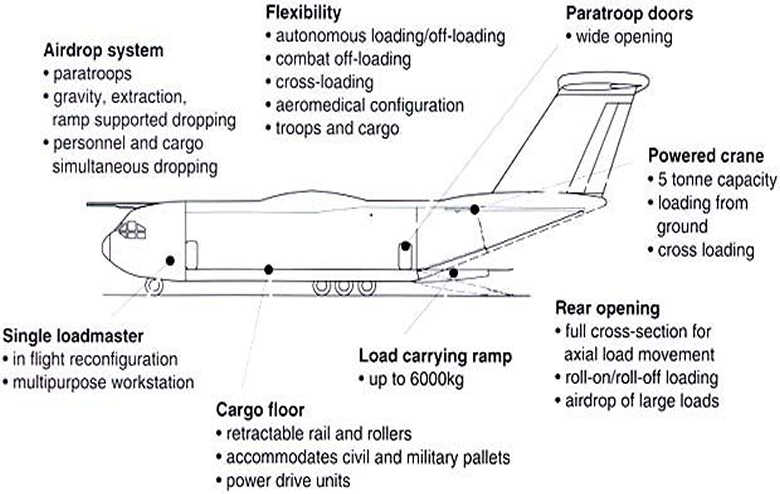 The cargo box dimensions are: Length, excluding ramp 17.71 m; ramp length 5.40 m; width 4.00 m; height 3.85 m; height, aft of wing 4.00 m.
The Airbus A400M will operate in many configurations including cargo transport, troop transport, MEDEVAC, aerial refuelling, and electronic surveillance. The cockpit features a fly-by-wire flight control system with sidestick controllers and flight envelope protection. Like Airbus' other aircraft, the A400M will have a full glass cockpit (all information accessed through large colour screens) and as such will represent a technological leap compared to the older C-130s and C-160s that many countries now operate. The A400M's wings are primarily carbon fibre reinforced plastic. The eight-bladed Scimitar propeller is also made from a woven composite material. Originally the SNECMA M138 turboprop (based on the M88 core) was selected to power the A400M. Airbus Military issued a new Request for Proposal in April 2002 which Pratt & Whitney Canada and Europrop answered. 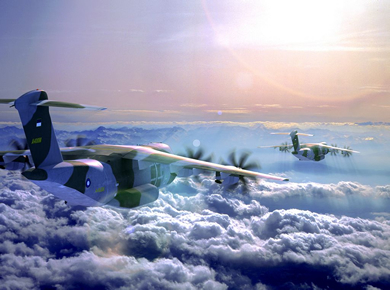 Airbus Military announced, after evaluating both designs, the selection of the Europrop TP400-D6 in May 2003.